JAKARTA, Indonesia (3 January 2019) – Wyndham Hotels & Resorts, the world’s largest hotel franchisor and leading provider of hotel management services, is pleased to announce the official opening of Wyndham Casablanca Jakarta on 31 December 2018. It is the sixth Wyndham-branded hotel in Indonesia and the first in the country’s vibrant capital city. Located on Jalan Casablanca in Central Jakarta, Wyndham Casablanca Jakarta is conveniently close to the city’s key business precincts, embassies and several major retail and entertainment areas. Guests can enjoy a comfortable night’s sleep in one of the 280 stylish rooms and suites including one-, two- and three-bedroom apartments and an opulent Presidential Suite that offers sweeping views of the glittering Jakarta skyline. 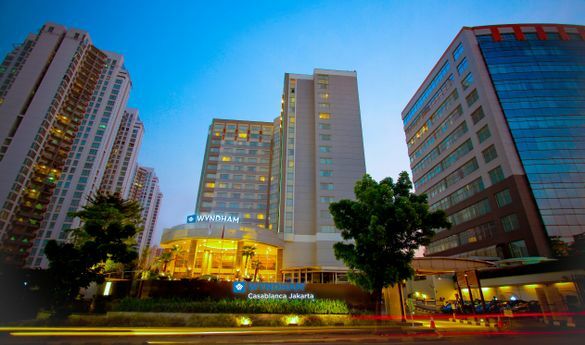 “Wyndham Casablanca Jakarta is perfectly positioned in Central Jakarta, surrounded by many businesses and attractions. This makes it ideal for the rising number of domestic and international visitors now choosing to stay in Indonesia’s capital city. As the seat of the ASEAN Secretariat and an important regional business and administrative hub, Jakarta is becoming one of Asia’s most important cities. We look forward to welcoming business and leisure travellers alike to experience Wyndham’s world-renowned hospitality in the heart of Jakarta,” said Joon Aun Ooi, president and managing director, South East Asia and Pacific Rim, Wyndham Hotels & Resorts. The hotel began its conversion from Park Lane Hotel Jakarta to Wyndham in July 2018. An oasis in the heart of the city, it offers a host of facilities including a large lagoon-style outdoor swimming pool, Jacuzzi and children’s wading pool. It has a fully equipped gym, and guests can unwind with beauty and massage treatments in the day spa. Home to two dining options including an award-winning restaurant and bar, Wyndham Casablanca Jakarta takes a fresh approach to dining with Riva Bar & Grill specialising in mouth-watering Wagyu and Black Angus steak along with other international dishes, while Café One offers an Asian-style menu in a casual all-day restaurant renowned for its sumptuous buffets. Thirteen flexible function rooms can host all types of events, from grand social occasions to private business meetings and training seminars, all supported by state-of-the-art audio visual technology. “We are thrilled to officially open Wyndham Casablanca Jakarta and, through our partnership with PT. Wyndham Hotel Management, provide guests with the stand-out hospitality and comforts that the Wyndham brand is renowned for. Wyndham’s management style is one that nurtures the needs of today’s modern travellers. Through a tailored approach the team strives to create meaningful personalised and memorable experiences for each and every guest.” said a representative from the owning company. The five-star hotel will be operated under a management agreement between Wyndham Hotels & Resorts’ preferred property manager in Indonesia, PT. Wyndham Hotel Management and PT. Staco Graha. PT Wyndham Hotel Management is the Indonesian subsidiary and management arm of Wyndham Destinations, which oversees a further nine hotels across Indonesia. Wyndham Casablanca Jakarta’s rates starts from IDR 1,250,000 including breakfast. For reservations email: reservations@wyndhamcasablancajakarta.com or visit www.wyndhamhotels.com. Wyndham Casablanca Jakarta participates in Wyndham Rewards, the simple-to-use, revolutionary loyalty program from Wyndham Hotels & Resorts. Named a best hotel rewards program for the past three consecutive years by U.S. News and World Report, Wyndham Rewards® offers members a generous points earning structure along with a flat, free night redemption rate—the first of its kind for a major rewards program. Members earn a guaranteed 1,000 points for every qualified stay and, through a long-term partnership with Wyndham Destinations, can redeem for a free night at any of more than 25,000 hotels, condos or homes around the world for just 15,000 points per room per night. Join for free today at www.wyndhamrewards.com.